The American Civil Liberties Union (ACLU) has filed a complaint with the Transportation Security Administration (TSA) about the controversial airport-security practice known as ‘behavioral detection’, which they say is ineffective. 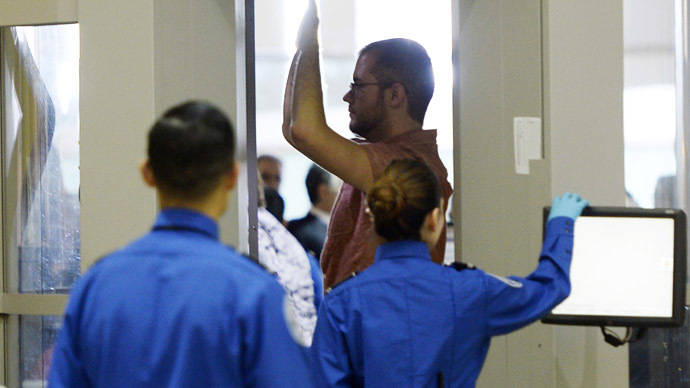 The TSA uses the so-called behavioral detection system as part of its Screening Passengers by Observation Techniques program, whereby special trained officers look out for suspicious passengers who are then sent for further screening. The TSA has never said what kind of suspicious behavior they are looking for but critics say things like fidgeting, sweating and eye movement can trigger suspicion. The ACLU lawsuit is based on the fact that the system has never apprehended any individuals who pose a security threat and critics say it also leads to racial profiling. The civil liberties body filed a Freedom of Information Act request for the relevant TSA documents in October, but the security service has still not replied. "Although the TSA has been using behavior detection techniques in some form since 2003, there is no known instance in which these techniques were responsible for apprehending someone who posed a security threat. However, the public knows little about the scope, effectiveness or purported scientific basis for these programs," the 15-page lawsuit says. This is not the first time the technique has been called into question. A 2013 report by the Government Accountability Office questioned its usefulness and said there is no solid evidence that it is effective. It even went as far as saying that Congress should limit the amount of money it is given. The service is not cheap. It costs $200 million a year to train and field 3,000 officers. The report found that in 400 cases, officers only have a slightly better chance of spotting deceptive behavior. “There has not been a single instance where a behavior detection officer has referred someone to a law enforcement officer and that individual turned out to be a terrorist," said Rep. Richard Hudson, R-N.C., who was head of the Homeland Security subcommittee on transportation. But John Pistole, a former TSA administrator, defended the practice and said it is crucial to airport security because the technique helps security officers to identify intent. “Defunding the program is not the answer. There would be fewer passengers going through expedited screening, there would be increased pat downs, there would be longer lines, and more frustration by the traveling public,” he told a Congressional panel in 2013. He also denied that racial profiling has any relevance to the program. "Anybody who is found to be profiling will be investigated and dealt with appropriately," he said. TSA’s employees’ union also defended it saying that an imperfect deterrent is better than no deterrent at all.